Big Medicine is one element in the larger sculpture: The Price of a Medicine Robe. According to Wikipedia, a bison named Big Medicine (1933–1959) was born in the wild on the National Bison Range on Montana’s Flathead Indian Reservation. The name “Big Medicine” was chosen due to the sacred power attributed to white bison. Following its death in 1959, its body was preserved and is now displayed at the Montana Historical Society in Helena. 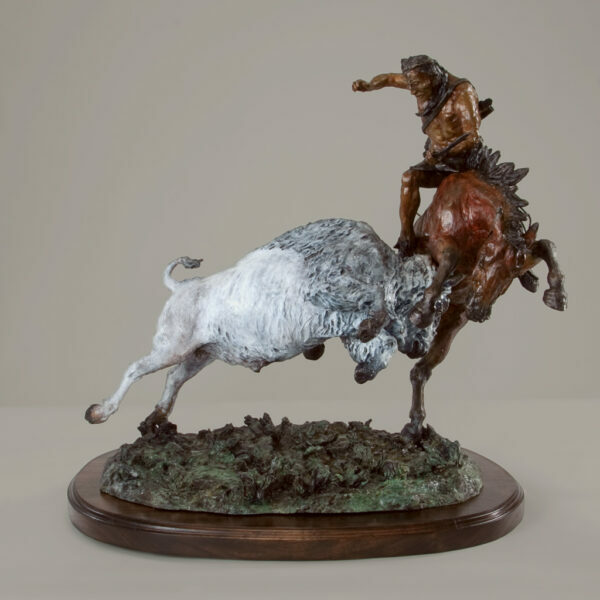 In the creation of this sculpture, Jay traveled to Helena to study the Buffalo.